Bebop is one of the most exciting, engaging, and popular jazz styles, and has captivated guitarists for decades. Though you may dig the bebop sound and want to learn to play it on guitar, it’s easy to be overwhelmed and not know where to start in your practicing. To help you explore bebop sounds in your playing, without the stress, this lesson teaches you the essential first steps in beginning bebop guitar. In the early 1940s, a new jazz style emerged from the displeasure some jazz musicians had with the commercialism of swing music. Musicians like saxophonist Charlie Parker, trumpet player Dizzy Gillespie, pianist Thelonious Monk, and other young jazz players reacted against the big dance bands by playing a kind of music characterized by advanced harmonies, frantic tempos, rhythmic intricacies and long improvisations. They were more interested in developing the technical aspects of music and increasing its aesthetic qualities, rather than enlarging their audience and wallets. There is much to be learned out of bebop today. Every jazz musician should be familiar with its language and techniques. This tutorial will help you to start learning bebop, we’ll have look at the concepts, vocabulary, scales, and techniques that are typical for this popular jazz style. Go slow with the exercises below, have fun with them, and enjoy your bebop guitar journey. Before you dive into learning how to play bebop guitar, here are 10 tunes to get the bebop sound into your ears. Listening to a style of jazz is just as, or more important than learning material on the guitar. If you wanted to learn a language but didn’t know what that language sounded like, it’d be tough to learn. It’s the same with learning a musical language such as bebop. As you work on bebop concepts, spend time each day listening to bebop in order to understand the sounds you’re aiming for in your practicing and performing. Before bebop, improvisations were based on the melody of a tune. A bebop improvisation is based on the harmony of a tune with little or no reference to the original melody. A bebop improviser should be able to outline a tune’s harmony in his solos. When you listen to a bebop improvisation and you would take away the accompaniment, you can still hear the chords of the standard in the improvised lines. A way of doing this is by putting emphasis on the chord tones. To be able to do this you should know your chord arpeggios very well in all positions on the neck. Another thing that can help you outline the harmony is voice leading. One of the most overlooked concepts in bebop is playing arpeggios up and scales down. You don’t always play arpeggios up and scales down, but this is an important and easy way to begin studying bebop on guitar. To help you get this sound into your ears and under your fingers, here are three examples of arpeggios up and scales down to explore. The first exercise uses a Dm7 arpeggio up and D Dorian mode down. Work this pattern in a few keys first, then take it to other positions before adding it to your solos over m7 chords in tunes and progressions you’re studying. The next example lays out a G7 arpeggio up and G Mixolydian mode down. Practice this pattern in a number of keys before taking it to other positions and adding it to your solos over jazz tunes. 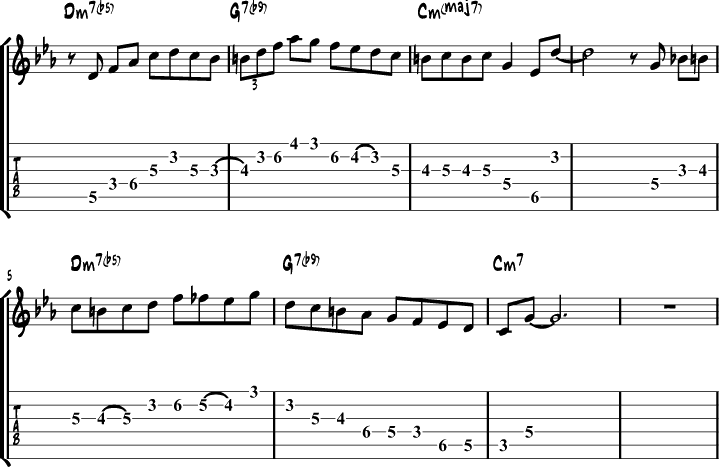 Here’s a Cmaj7 arpeggio up and scale down to get you started with this sound in your playing. Work this concept over other maj7 arpeggio and scale positions, then take it to other keys when comfortable. One of the most important concepts in bebop is tension and release, especially with the use of chromatic notes to achieve this sound. While chromatic notes are an important bebop sound, you can’t achieve a solid line by randomly adding chromatic notes into your scales and arpeggios. Instead, it’s the use of organized chromatic notes that helps build the bebop sound in your solos. In this section, you learn about three essential chromatic notes and how to use them to create a bebop flavor in your solos. The first chromatic note you learn is the passing note, where you add a chromatic note between two diatonic notes in your playing. Here’s an example of a passing note added between the 2nd and 3rd notes of the C major scale. The next chromatic note is the approach note, where you play one fret below a chord or scale note and resolve into the diatonic note from there. You can also us approach notes from a fret above scale or chord tones, but it doesn’t always work as well as below. For this reason, start with the approach note below before exploring approach notes from above in your playing. Here’s an example of a Cmaj7 arpeggio with an approach note into the 5th of each octave in this shape. Practice adding approach notes to other chord tones as you expand this sound in your playing. The next chromatic concept uses two chromatic notes to build what’s called an enclosure. There are a number of enclosures to explore, but the best place to start is chromatic above, chromatic below, then resolving to a diatonic note from there. Here’s a Cmaj7 arpeggio with an enclosure around the 3rd in each octave of the shape. Take it to other arpeggios and positions when comfortable, and add it to your jazz guitar solos to bring it to a musical situation. Here’s a line that uses all three chromatic notes from this section. Start by learning the line in C major, and then take it to other keys in your practice routine. Add this line to your solos to bring it to a musical situation. Then, when you’re ready, write your own lines that use these chromatic notes. One of the most common ways to bring a bebop sound into your playing is using the bebop scale over minor 7, dominant 7, and major 7 chords. These scales are all built by adding one passing note to a common mode, Dorian, Mixolydian, and Ionian. Because of this, they help organize chromatic notes in your scale lines as you bring an extra chromatic note into each of these scales. In this section, you learn two fingerings for each scale as well as a sample line that uses all three bebop scales. Start by working each scale one at a time and adding it to your soloing repertoire over chords and progressions. From there, mix two and then all three bebop scales into your solos as you take these ideas further into your playing. 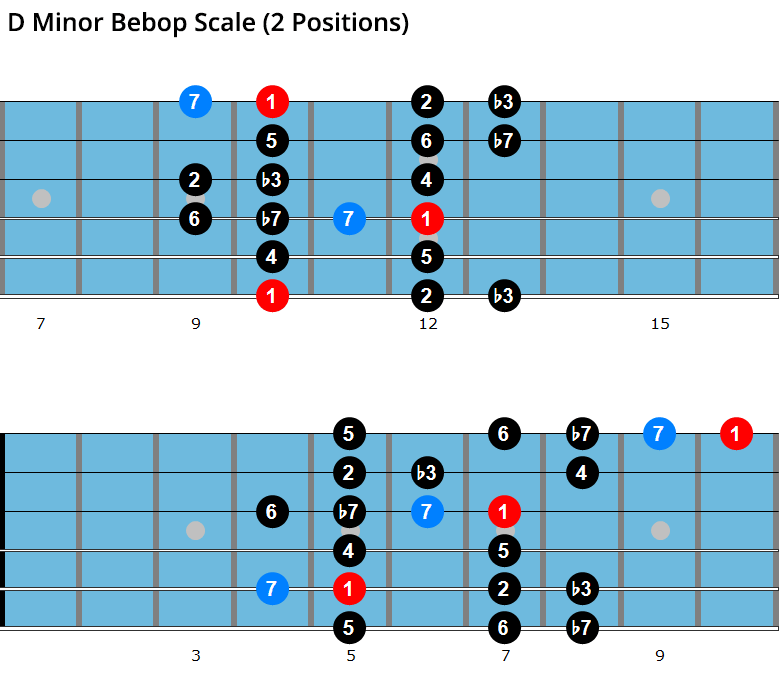 The first bebop scale is used to solo over minor chords, and is built by adding a major 7 passing note to the Dorian mode. You sometimes see the minor bebop scale with a major 3rd passing tone added, but this creates a scale that has the same notes as the dominant bebop scale. To help keep these sounds separate in your solos, you learn the major 7 passing note version in this lesson. Start by learning one shape at a time and adding them to your soloing practice over one-chord vamps and simple tunes. Use the major 7 as a passing note, don’t sit on it in your solos. Over time you can linger on that note, but in the beginning, it’s more important to get it into your ears as a passing note before moving on to more advanced applications of this scale. The next bebop scale is used over dominant 7 chords and is built by adding a major 7th passing note to the Mixolydian scale. 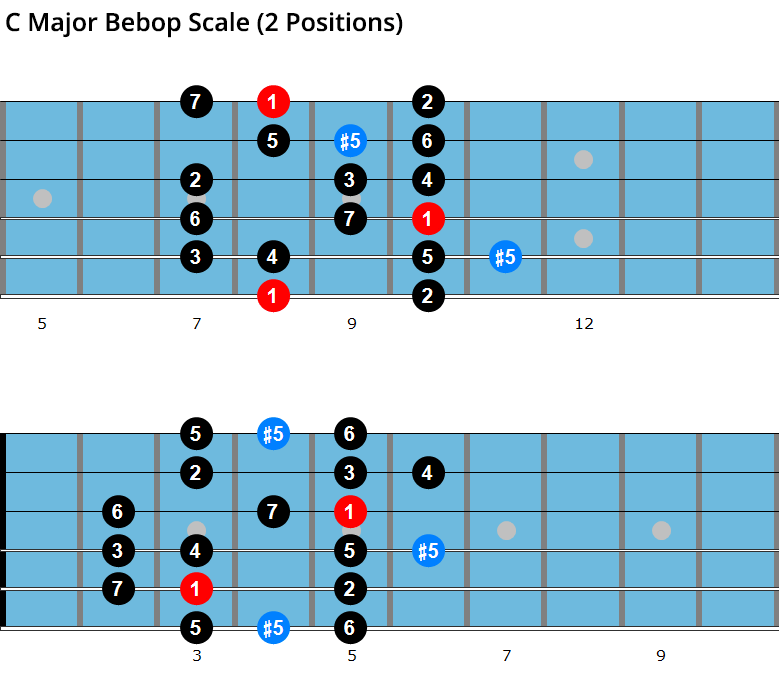 Because this scale is the most popular of the 3 bebop scales in this section, you often see this scale called simply the bebop scale. 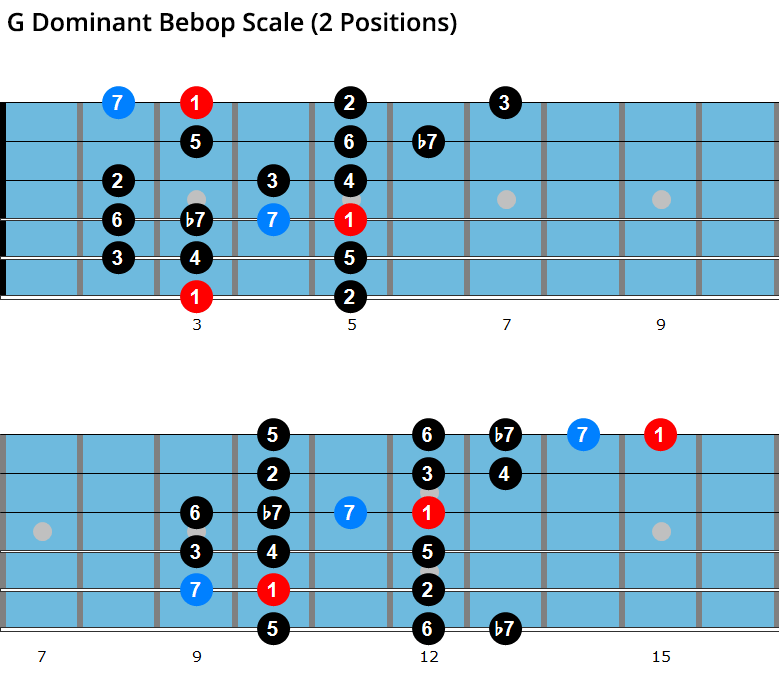 To differentiate it from the other scales you can also call it the dominant bebop scale. Here are two fingerings to help get this scale under your fingers. When you have one shape down, use it to solo over backing tracks as you integrate this scale into your soloing lines and phrases. The major bebop scale is used to improvise over major chords and is built by adding a #5 to the major scale. When doing so, you create a passing note between 5 and 6 (5-#5-6), and 6 and 5 (6-#5-5). Again, as you add this scale to your soloing, use the #5 as a passing note. Don’t sit or rest on it too long in the beginning. Over time your ears will become accustomed to this passing note and you can spend more time on it in your lines. But, in the beginning, it’s best to pass through it from one scale note to another to avoid any awkward sounding phrases in your solos. To finish your introduction to bebop scales, here’s a line that uses bebop scales over every chord in a major ii V I progression. 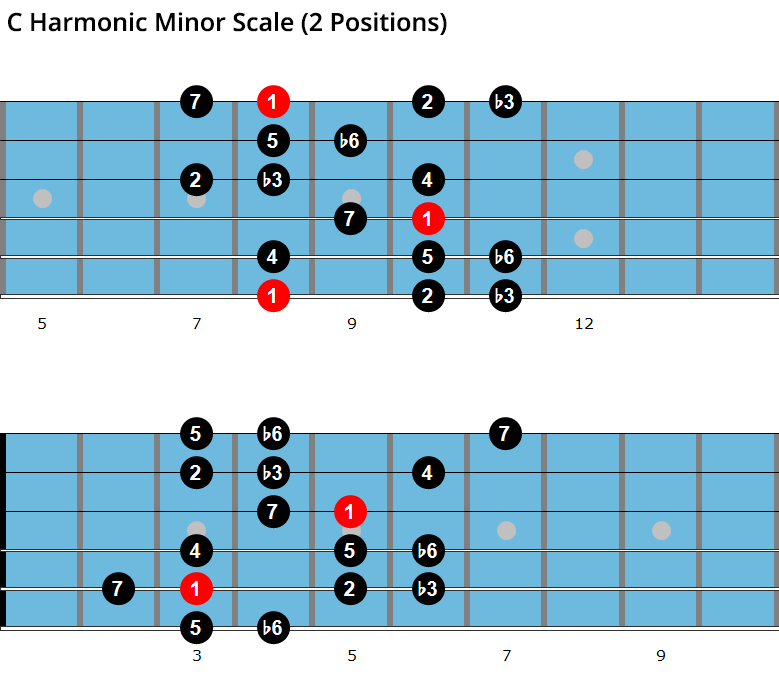 Another scale that is often used in bebop is the harmonic minor scale, usually over minor ii V Is. You can play the harmonic minor scale of the I over all chords in this progression. For example: over a ii V I in C minor (Dm7b5, G7, Cm7), play the C harmonic minor scale. As well as learning concepts when studying bebop, it’s also important to learn vocabulary from this style of jazz. 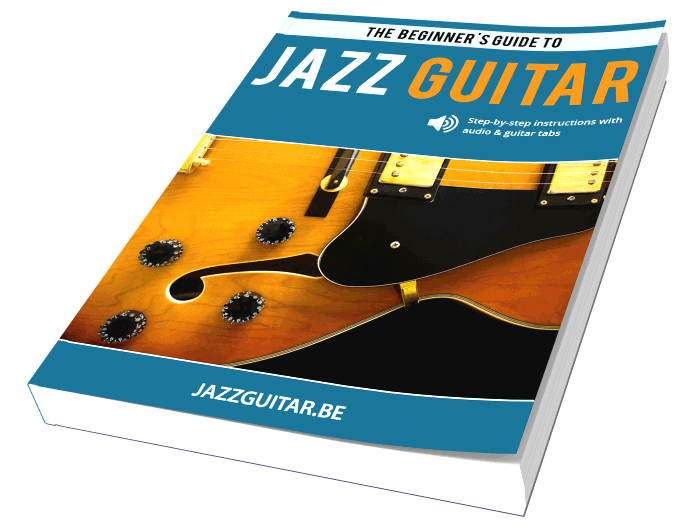 In this section, you learn four classic jazz guitar licks that are used over and over by bebop soloists in their improvisations. Learn each of these phrases, as well as the theory behind them, and then add them to your own solos. You don’t want to recite these phrases forever in your playing. But, learning them is a great way to begin incorporating the bebop language into your solos. Then, over time, you can alter and personalize these lines to make them your own as you adapt them to your bebop soloing style. The first bebop line is one you find in Charlie Parker’s playing, as well as many other bebop musicians. It’s built by approaching the iim7 arpeggio with a half step (the C# in the line below) and then ending on the notes C-A-A#-B. The A# is a passing note between A and B. As well the C is the b7 of Dm7 and the B is the 3rd of G7, so you use solid voice leading here as you target those guide tones in the line. Work this phrase over Dm7-G7 to begin. Then take it to other keys and other positions as you bring this line into different musical situations. Here’s a classic line based on the opening melody to Honeysuckle Rose, and one that’s been used by every bebop musician at some point in their careers. This line is built by playing down the bebop scale over a iim7 or V7 chord, then playing up a triad and resolving to the 6th of that chord. You can see this over Dm7 and G7 in the examples below. The next phrase uses the D melodic minor scale over the G7 chord, creating a G7#11 sound in the process. Melodic minor and Lydian dominant are both essential bebop sounds, and therefore are worth studying further in your playing. The easiest way to apply these sounds to your solos is to use them over ii V progressions. Whenever you have a iim7-V7 progression, play melodic minor from the iim7 chord over both to hit those sounds. This means that if you have Am7-D7, you play A melodic minor over both chords to create the AmMaj7 and D7#11 sounds in your lines. The raised 7th over a m7 chord and #11 over a 7th chord creates tension, so it takes time for these sound to become normal to your ears. Because of this, start exploring those sounds sooner than later in your playing so that these sounds will come out naturally in your playing. The final bebop vocabulary line is a variation of the previous lick, where here you mix up the order of the first four notes. Work this line on its own, then when ready mix this phrase with the previous line to hear how they compare and contrast in your playing. As was the case with the previous line, you play D melodic minor over the first bar of the line. This creates a DmMaj7 sound over the Dm7 in this instance, as the raised 7th from D melodic minor lands on the Dm7 chord in this line. Now that you have checked out essential bebop techniques, you learn a solo over the Charlie Parker tune Scrapple from the Apple. Most of the ideas in this solo are based on Parker’s improvisation and use the concepts you studies earlier in this lesson. Start by learning one phrase at a time (2-4 bars). Then, glue those phrases together until you can play the whole solo as one. Work the solo along with the audio example and then take it to the backing track on your own when you’re ready. Lastly, pull out your favorite lines and phrases and work them in different keys before adding them to your solos over other jazz tunes. Have fun with this solo as you summarize all of the ideas from this lesson over a famous bebop tune. Grazie , molto interessante ! Do yu have a collection Bebop guitar tutorial CDs that I can purchase? Would you devote a lesson to BLUES FOR ALICE?